Grouping of multiracial people. Black and white photo. "There aren't any you can see. You just can't tell from outward appearance who is infected with HIV, the virus that causes AIDS. To determine your risk for HIV and AIDS, call your State or local AIDS hotline. Or call the National AIDS Hotline at 1-800-342-AIDS. Call 1-800-432-7889 (TTY) for deaf access." Grouping of multiracial people. Black and white photo. AIDS doesn't have signals you can see. Blue dot sticker. Order number: P551. CDC National AIDS Clearinghouse, Catalog of HIV and AIDS education and prevention materials September 1994, p. 14. 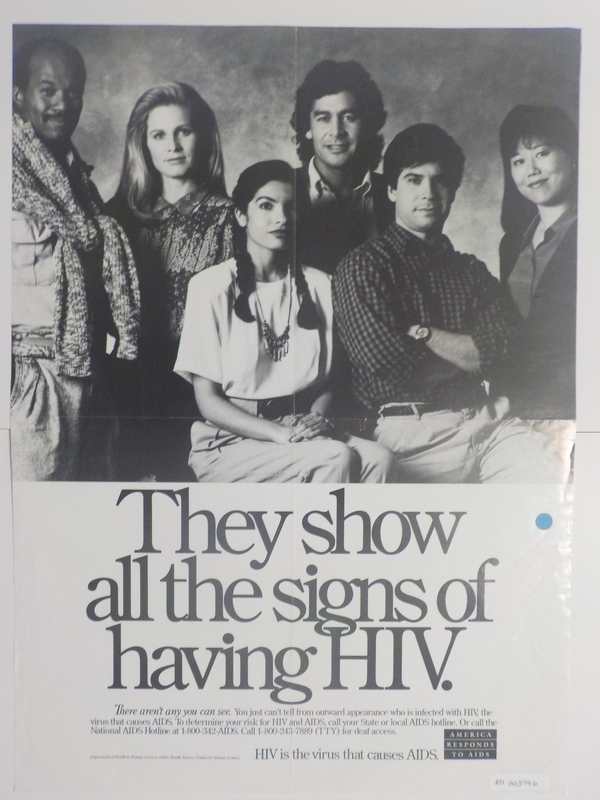 "The message of this poster, featuring individuals from various racial an dethinic groups, is that you cannot tell by looking at people whether or not they are infected with HIV."